Though the disparate groups who hold power today in Tbilisi rode to power three years ago as the ‘Georgian Dream’ coalition, life for them is quickly devolving into something more like a nightmare. With fresh elections due in October 2016, prime minister Irakli Garibashvili resigned abruptly on December 23 after just over two years in office (and at the ripe old age of 33). The political crisis has left Georgia, including both the government’s supporters and detractors, stunned. Giorgi Kvirikashvili, foreign minister only since September 2015 and, formerly, the minister of economy and sustainable development, became Georgia’s new prime minister-designate on Christmas Day. Like Garibashvili, he’s a political unknown with longtime ties to Ivanishvili, formerly the head of the Ivanishvili-owned Cartu Bank. Before ascending to power, Garibashvili was a longtime employee of Bidzina Ivanishvili, the billionaire who financed the Georgian Dream (ქართული ოცნება) coalition, united mostly by its opposition to the policies and anti-Russian orientation of Georgia’s former president Mikheil Saakashvili. Garibashvili rose quickly in the new order after the Georgian Dream coalition won the 2012 parliamentary elections. While Ivanishvili himself held the premiership between October 2012 and November 2013, it was Garibashvili, by then a trusted Ivanishvili adviser, who took the pivotal role of minister for internal affairs. In that position, barely out of his twenties, Garibashvili was tasked with ‘reforming’ the Georgian police forces, though he spent more time throwing several former Saakashvili era officials in prison. When Ivanishvili decided to step aside from frontline politics, no one believed that he was necessarily ceding control of Georgia’s new government, and Garibashvili never truly shook the impression that he was really just a puppet serving at Ivanishvili’s pleasure. That impression will be even harder to shake now, with tongues wagging that it was Ivanishvili who ordered Garibashvili’s resignation. It isn’t an outrageous leap to believe that Ivanishvili is still calling the shots in Georgia’s government, nor is it unrealistic that he is eager to shake up Georgian politics, above all to protect his return on investment as fresh elections beckon. Garibashvili never had much of a political power base independent of Ivanishvili. Moreover, he often clashed with Giorgi Margvelashvili, Gerogia’s president, who easily won the October 2013 presidential election (to what is now a mostly ceremonial office, thanks to reforms in the last year of the Saakashvili era that transferred power from the presidency to the parliament). Margvelashvili, formerly a little-known academic and former education and science minister, owes his position, like Garibashvili, mostly to Ivanishvili and his bankroll, though he is nominally an independent and he has demonstrated his willingness to disagree with Ivanishvili publicly from time to time. It’s no surprise to anyone that the Garibashvili-led government has struggled for the past two years. The economic expansion of the Saakashvili years, with its technocratic zeal for improving infrastructure and attracting foreign development, are now a long-faded memory. Inflation is up, GDP growth is stagnant by the standard recent trends (now expected to be less than 3% and far below the 5% prediction earlier this year) and Georgia’s currency, the lari, is down — by nearly 40%, compared to the US dollar in the last 15 months. 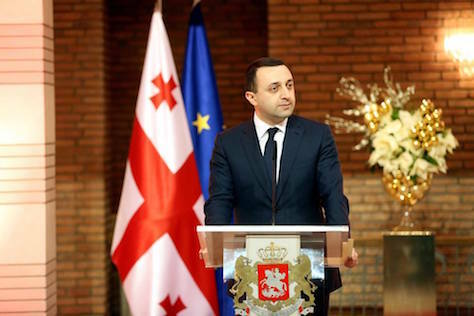 Garibashvili’s government has lurched between the rhetoric of reform and a far more unfocused reality, given the varied perspectives among the nationalists, socialists and liberals that comprise the many parties that comprise the Georgian Dream coalition. It’s not necessarily that Saxony is shifting to the right, as The Economist wrote earlier this week about the results of last Sunday’s state elections in Saxony. It’s more that right-leaning voters are switching allegiances from one party to another, not unlike similar shifts in western Germany and at the federal level. Though the Christlich Demokratische Union Deutschlands (CDU, Christian Democratic Union) will have to find a new junior coalition partner, there’s no doubt that it will continue to govern under minister-president Stanislaw Tillich (pictured above with German’s chancellor Angela Merkel), who won his second reelection after assuming the office in May 2008. Neither its junior partner in the outgoing government, the liberal Freie Demokratische Partei (FDP, Free Democratic Party), nor the neo-Nazi Nationaldemokratische Partei Deutschlands (NPD, National Democratic Party) met the 5% hurdle to return their legislators to Saxony’s 126-seat state parliament, the Landtag. 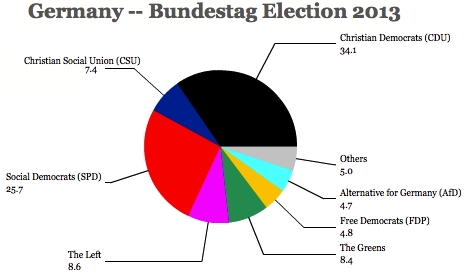 Many of their voters appear to have supported the newly formed, anti-euro Alternative für Deutschland (AfD, Alternative for Germany) instead, which won 9.7%, making them the fourth-largest party in the Landtag with 14 seats. None of this news, however, was unpredictable, because the results largely lined up with polls. The election was most disastrous for the Free Democrats, a party that, it’s not an exaggeration to say, faces political extinction. Though the FDP made some of its strongest gains in its history in 2009 at both the federal and at state levels, it’s been facing backlash for the past four years. In last September’s federal elections, it lost all 93 of its seats in the Bundestag, the lower house of the German parliament, shut out for the first time in postwar history. Now that it’s lost all of its seats in Saxony’s Landtag, it will no longer be a part of any state government, a massive turn for a party that just one year ago controlled the German foreign ministry, among other portfolios. 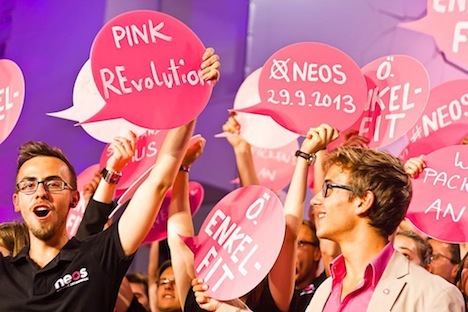 It now holds seats in just eight of 16 state assemblies, a number that could drop to six if it wins less than 5% of the vote in upcoming September 14 elections in Brandenburg and Thuringia. LIVE BLOG: Can Merkel win an absolute majority? 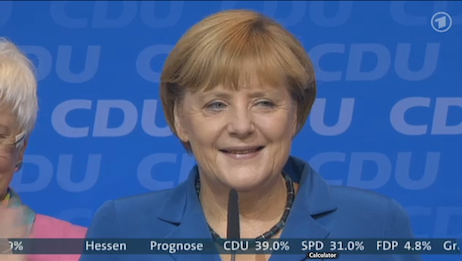 With results yet to come in, the first exit polls show that German chancellor Angela Merkel winning a huge mandate. Merkel’s center-right Christlich Demokratische Union Deutschlands (CDU, Christian Democratic Party) and its Bavarian sister party Christlich-Soziale Union in Bayern (CSU, the Christian Social Union): 42.5%. The center-left Sozialdemokratische Partei Deutschlands (SPD, Social Democratic Party): 26.5%. The democratic socialist Die Linke (the Left): 8.5%. Die Grünen (the Greens): 8%. Conservative, eurosceptic Alternative für Deutschland (AfD, Alternative for Germany): 4.8%. Liberal Merkel coalition partner Freie Demokratische Partei (FDP, Free Democratic Party): 4.5%. How much of a victory is this for Merkel? It’s absolutely huge. With 42.5% of the vote, Merkel’s CDU/CSU union would win just 1.3% less than Helmut Kohl won for the CDU/CSU in 1990 — and that was in the afterglow of reunification. It looks like Peer Steinbrück will have led the SPD to a better result this year than Frank-Walter Steinmeier, the former foreign minister who led the SPD to win just 23% in the 2009 election. It’s still not a great result for the SPD, and the exit polls show that the SPD didn’t actually narrow the gap in the final days as some pre-vote poll surveys had indicated. Now let’s think about what’s still uncertain — it’s obvious that Merkel’s preferred coalition partner, the FDP, is struggling. It would be the first time in Germany’s postwar period that the FDP fails to win enough seats to enter the Bundestag — their worst result was in 1969, when it won just 5.8% of the vote, and it follows their best-ever result from 2009 — 14.6%. It’s been a spectacular collapse, and it’s hard to believe that Philipp Rösler’s leadership will survive very long. There’s a lot of rebuilding ahead. 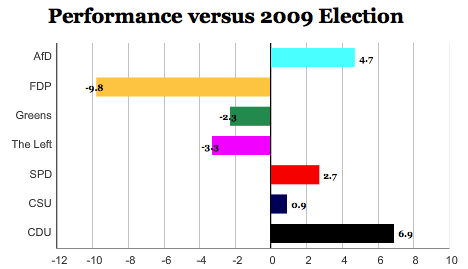 (Note that in Hesse, where state elections are being held, the FDP is falling short with just 4.8% as well. While the CDU has won around 39%, the SPD is winning 31%, the Greens 10.5% and the Left 6% — and that means we could see another SPD-led attempt to govern with the support of the Left. Either way, it’s hard to see the current CDU/FDP coalition continuing to govern. Here’s more on that race). It’s still too soon to know whether the AfD or the FDP will win less than 5%. 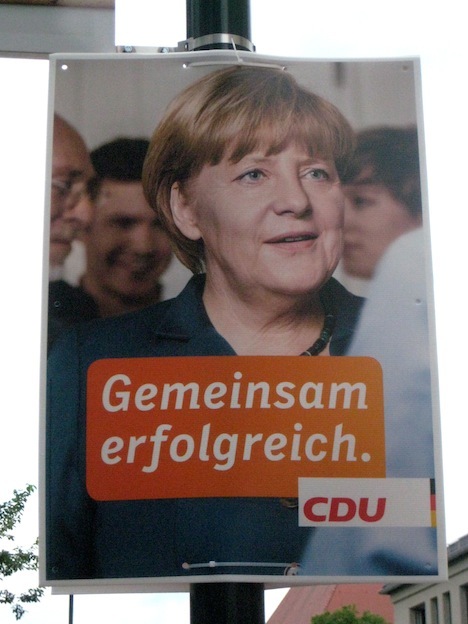 But if they do, it’s conceivably possible for Merkel to win an absolute majority with just the seats of the CDU/CSU. Thought 42.5% isn’t an absolute majority when the denominator is 100%, it comes very, very close when the denominator is 85.5% — the sum of the voter support of the four parties to clear the 5% hurdle. If Merkel falls just a handful of seats short, and the FDP doesn’t enter the Bundestag, it may not be worth entering a coalition, but trying to govern with a very strong minority government. Obviously, a ‘grand coalition’ with the SPD would be the most likely coalition, but as I’ve argued for weeks, a ‘black/green’ coalition between Merkel and the Greens has a lot of natural appeal. 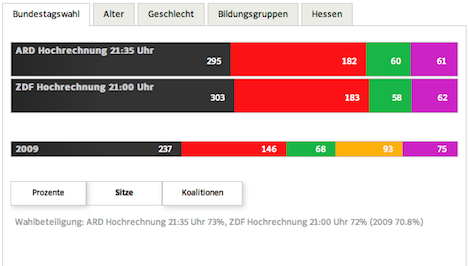 So it seems pretty clear that the CDU/FDP coalition that governs Hesse will not be reelected. But neither will the SPD/Green coalition have enough seats to control the Hessian Landtag. That leaves the Left, which will win around eight seats, as the kingmaker — just as in 2008, when the SPD found itself in nearly the same situation. When that happened in 2008, it led to a year of disorder that ultimately resulted in snap elections in 2009. SPD leader Andrea Yspilanti faced an internal revolt when she tried to form a government with the support of the Left, and Hessian voters gave the SPD 13% less support in the 2009 elections. 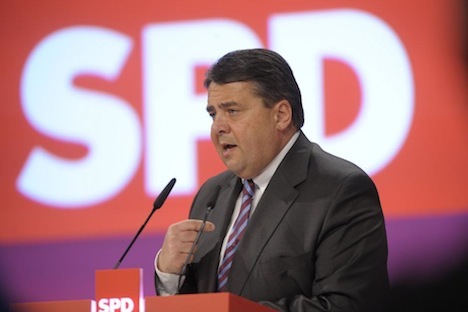 This time around, we’ll have to see if Thorsten Schäfer-Gümbel, the new SPD leader in Hesse, can deliver a more graceful partnership with the Left. Volker Bouffier, the CDU leader, will also likely try to determine if there’s space for a grand coalition or even a CDU-Green coalition in Hesse. CSU hardliners. With an ultra-thin majority, Merkel will not have a huge margin for victory. 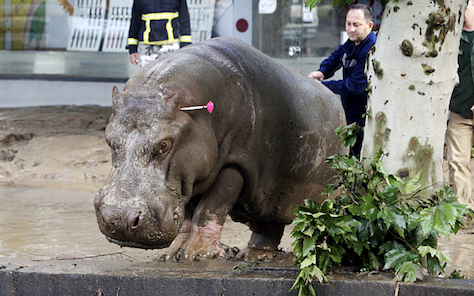 That could risk pulling her further to the right. Even if the AfD doesn’t make it into the Bundestag, Germany’s parliament already has a mildly eurosceptic party — the Bavarian CSU. Top CSU leaders, including Bavarian finance minister Marcus Söder have called on Greece to leave the eurozone, which makes them about as eurosceptic as the AfD. 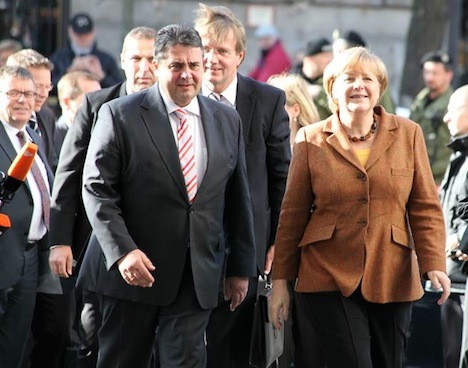 In a world where Merkel will want the flexibility to negotiate further bailouts for Greece, Portugal and other challenged European economies, and potentially a European banking union or greater fiscal control, she’ll want the support of a strong pro-European government. Bundesrat considerations. With the likely loss in Hesse, the CDU/FDP will control just 10 seats in the Bundesrat, the upper house of the German parliament. 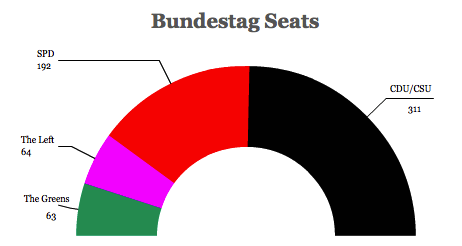 Leftists will control 41 seats, and CDU/SPD grand coalitions at the state level will control another 18 seats. That means that Merkel will still have to look toward consensus in order to govern, and pulling either the SPD or the Greens into government could smooth the passage of legislation through the upper house. Political calculation. It may look like joining a coalition as Merkel’s junior partner is hazardous to your health as a political party. 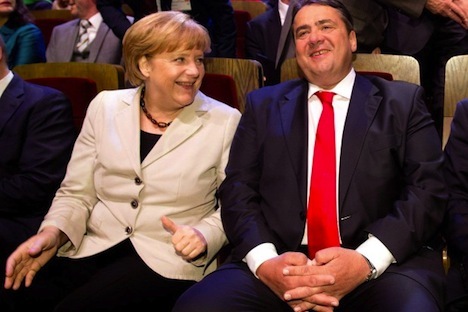 The SPD, after four years in a grand coalition with Merkel, had a disastrous 2009 election and now the FDP, after four years in government, will leave the Bundestag altogether. But a coalition with the Greens could make political sense for both the CDU and the Greens. By separating the Greens from their traditional partners in government, Merkel could generate even more disunity on the German left. 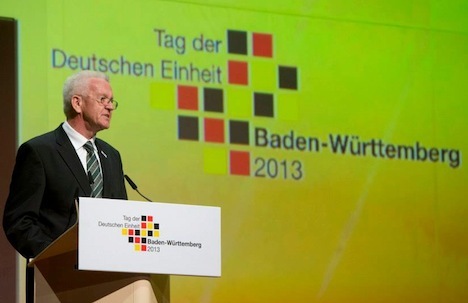 But the Greens have had a difficult election — and there’s now evidence to show that they do better under a moderate, business-friendly platform (see the success of Winfried Kretschmann, the only Green minister-president, in the German state of Baden-Württemberg) than under the kind of leftist campaign — tax increases and advocating ‘veggie day’ — that the Greens ran in the federal 2013 campaign. A turn to the center could really maximize the potential of the Greens in the 2017 election, and nothing could telescope that shift more than a partnership with Merkel that pulls Germany’s government ever so gently from the right to the center over the next four years. We’re obviously going to have to wait to know the final numbers. Keep in mind also that there’s still a chance that the eurosceptic AfD could still sneak into the Bundestag.